By RSVP only – open only to graduate students and faculty for observation. Must RSVP at jk2857@columbia.edu to attend as an observer. 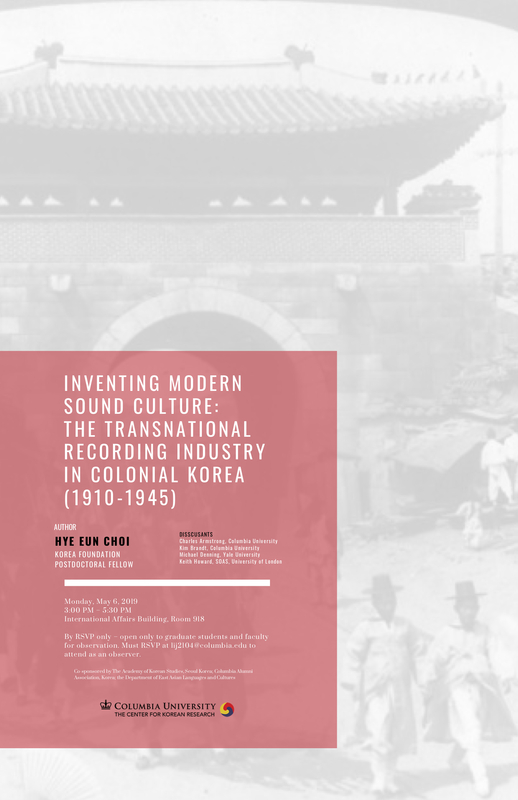 My manuscript, tentatively titled “Inventing Modern Sound Culture: The Transnational Recording Industry in Colonial Korea (1910-1945),” is the first book project that traces the birth of the Korean recording industry at the intersection of capitalism, colonialism, and globalized modern sound culture. Through an examination of government, media, and corporate sources, I demonstrate that transnational record companies, rather than colonial authority, initiated the formation of the recording industry in the Japanese Empire in the early 20th century. That is, utilizing funding, technology, and master recordings from the West, the record companies sought profits in both Japan and its colonies. Their activities, in turn, helped expose Korean audiences to globally popular recorded music almost simultaneously with audiences in the Japanese metropole. In addition, the record companies allowed Korean sound professionals to manage the production of Korean records due to their ability to create successful products in their own market. Therefore, along with their Japanese counterparts, these professionals produced Korean records in globally influenced yet locally inflected genres which were consumed across East Asia. Rather than approaching Korean sound professionals as a monolithic group of colonized subjects, I pay close attention to the ways in which sound professionals of various educational backgrounds, genders, and social positions negotiated, competed, and cooperated to earn reputations in their fields and receive the financial rewards they desired. My dissertation thus foregrounds their individual agency in the modern transformation of sound culture in colonial Korea.